Learn guitar in a small class setting . . . This September, I’ll be restarting my guitar classes at the Boston Center for Adult Education. The first one starts at 6pm and is for beginners – total beginners who have never even seen a guitar, much less played one. I start with simple chords and scales – the same as the material in “Easy Guitar Chords – Lesson 1” video on this website – and by week 5 we start working on some simple songs to play with those chords. I also teach a little theory during the class relating to how to tune the guitar, and talk a little bit about reading the rhythmic aspect of standard notation. I’ll be offering this class again November 1st – classes run from 6pm to 7:15 on Wednesday nights for 6 sessions. To sign up, please visit their website here. For more information, contact me using the form on the right or via email or the phone number in the upper left of the screen. 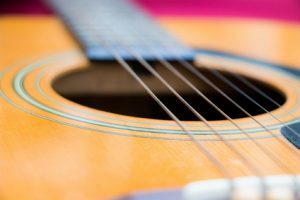 Taking group guitar classes is a fun way to get introduced to the guitar, and there are some advantages. One is that you’re forced to go every week – rescheduling is not allowed – so there’s greater incentive to consistently practice. There’s more of a social aspect to it as well, which makes it kind of fun, and you get to watch other people and in some cases learn from them. On the other hand, you don’t get the same level of attention that you do in a private lesson, so if there are specific things you’d like to work on, private lessons are better. You get to pick the songs and the pace of instruction is geared toward your progress, whereas you might have to go slower or faster than you would like in a group class.